Later this month, after dgym and I have spent a couple of weeks biking around Cornwall and re-building our hill muscles, I will be starting out on a ride to Corsica. This will take me down through Dorset to Poole ferry port, across the sea to Cherbourg and down through France to Marseille, from which I will take the ferry to Corsica. However, I am due in Normandy at the end of October for a family holiday so will be needing to travel back up the length of France at a rate which my poor little legs cannot possibly achieve. This means I will be travelling from Marseille to Paris on the lovely speedy TGV, and then taking a further train up into Normandy. It is well documented on sites such as Bike Access that, whereas France's roads are among the most bike-friendly in the world, its railway system is the exact opposite and the best way to get around this is to partially disassemble the bike, bag it up in an housse and treat it as luggage. Unfortunately, commercially-sold bike bags tend to be bulky, heavy and expensive, not really suitable for carrying around in a pannier for four weeks. I quite enjoyed our last sewing project, which was making litle padded travel cases for our laptops so, having ready access to the best fabric shop in the universe, and being a bit low in the funds department and keen to carry as little as possible around France, it made sense to follow Q May's excellent instructions for making your own housse. I started out by measuring up my lovely machine. Strictly speaking, the bike in its housse should fit within 120cm x 90cm - however, commercial housses which are sold specificically to take on the TGV, are often larger than this, and according to the instructions it should be possible to get away with 140cm x 110cm. Fully assembled, my bike measures 178cm x 95cm. The height is fine, but it is clearly far too long. So I could probably get away with just removing the wheels, front rack and rear fender - however, I could take off the rear rack to get it down to the strictly required size. Since I am going to have to reassemble it to get across Paris from one train to another (as various people have pointed out, I could get a taxi but I have never been to Paris before, I have a 2hr 20min changeover and I think it'd be nice to have a ride across town and quickly see some sights), I want the option of taking off as little as I can get away with, so I decided to go for the recommended 140cm x 110cm. 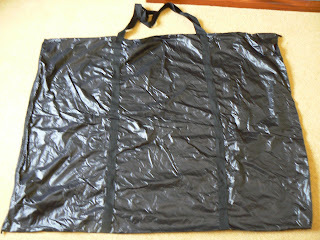 I can always take more off and fold away the excess fabric to make the bag smaller. Stur is the home of the best fabric shop in the universe. My mum has a sewing machine and I don't. Hanson's has everything you could ever want for a sewing project. It certainly had everything I could want. 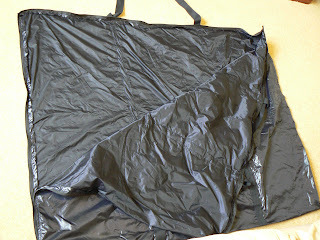 I knew from the beginning that ripstop nylon would be my fabric of choice for this project. It's strong, light, water resistant and, like the name says, it doesn't rip. If the chainring gets caught up in the fabric and makes a hole, hopefully damage will be limited and I can simply patch it up with duct tape. I chose the darkest colour they had as it's going to end up with oil stains on the inside. I also decided that I wanted a zipper along the top and sides. I was a little worried I wouldn't be able to find a long enough zipper, but was delighted to learn that Hanson's sells it by the metre. I wasn't able to find the exact weight of thread suggested by the instructions but did find upholstery thread which seems pretty tough, and a set of machine needles tough enough to take it. I bought slightly more than the required amount of everything to allow for mistakes. 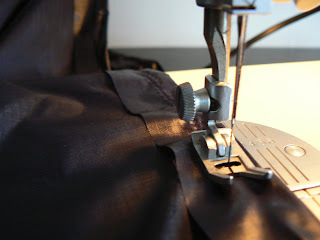 create a 1-inch hem around the edges. seam up the remaining open side(s). See the original page for full details. It was fairly easy to make once I'd remembered how to use a sewing machine! There's a lot of fabric there, take care not to get anything caught under the needle that shouldn't be there, or you'll end up unpicking as I did at one point. There is quite a lot of sewing here, what with all the hems, and especially if you choose to add the webbing and put the zip along two sides. I'm glad I bought two reels of thread as I did end up starting on the second - and I still have leftovers of everything for repairs / enhancements. I'm not sure whether I made the straps the right length, they may be too long, but I guess I will find that out. One word of advice: if you have attached an open ended zipper, please don't spend ages trying to get the slider on at one end, then delightedly zip up your creation, only to zip it straight off the other end! 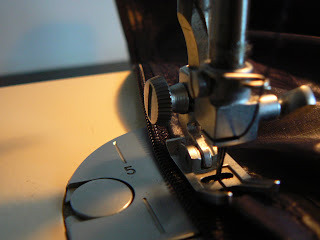 A few stitches or a blob of glue at each end should stop the slider coming off. I'm rather pleased with it. It zips and unzips nicely (although there is quite a lot of hem on the inside which sometimes gets caught in the zipper, it may be worth trimming this. Here it is, zipped and unzipped. It weighs in at 280g, 100g lighter than the one described in the instructions. 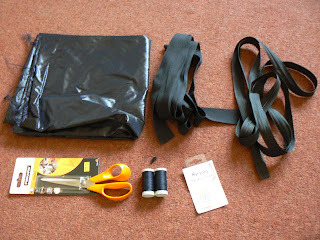 It would be even lighter if you only zippered the top, and didn't bother with the webbing. 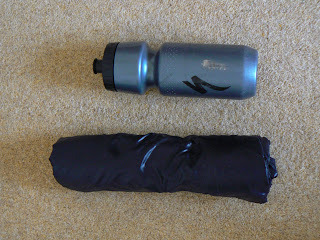 It also rolls up nicely to about the size of a bike bottle (it looks slightly bigger in the picture but can easily be further compressed). It measures 109x135cm, slightly smaller than I have aimed for, I think I may have made the hems a little too wide. It's a good idea to test out the disassembly of your bicycle, both to check it will fit the bag and to make sure there are no problems with taking things apart. When I tried removing my front rack, one of the screws holding it on turned out to be stuck, and ended up snapped. I also found I didn't know how to rotate the handlebars. However, I did learn that it fits the bag just fine with the front rack and rear fender removed. I look forward to testing the bag out properly, hopefully there will be more to report in a couple of months time when my bike has travelled the length of France inside it. great, I'm just about to go measure up my bike, thanks for the pointers. I haven't written it up yet, but I used the bag successfully, as I mentioned it ended up a little narrower than planned so was a bit of a squeeze, but I got the bike in there. It got bashed around quite a lot as the trains were very busy due to strikes, but the fabric and stitching held out really well. We are catching the train to Paris, and then have a 10 days in 2 month Eurail train pass. so just really see where it takes us, ride when the weather is bearable and jump on a train for the big/cold/windy legs of the trip. we are planning to end up in Greece near the end, and then if the situation allows, train Turkey/Iran/Pakistan/India and chill out in India for a while. We have a family friend who makes Kites so I'm doing the measurements today, and hopefully (I don't know if he knows it yet) he can make it and send it over. I'll Document my experience and let you know how it goes. Wow, sounds awesome! Pretty flexible too if you can just ride or get the train depending on what you feel like or how the weather is! I look forward to hearing about it.